Regular visitors to this blog – we generously allow ourselves the plural 'visitors' – will know that we are not ones to let ignorance deter us from forming sound opinions, well expressed. So firstly, a confession of ignorance. I have no firsthand idea of what social media are. I have never knowingly visited a Facebook page or twittered in any way. I can't name any other forms of social media. I understand that some things called hashtags are very important, but why that is I cannot say. But it gets worse. Facebook and all the other social media are playing an important part the progressive infantilisation of western society. Yet another confession of ignorance has to be made. I know nothing about the US education system, what a 'fraternity' or a 'sorority' is, or why these organizations name themselves with letters of the Greek alphabet. The concept of 'yearbooks' with photos of all the students of a year and some comments on them is repellent. The golden lads and girls of the year glittering among a background of dullards with forced smiles, bad hair, bad teeth, bad breath and acne. 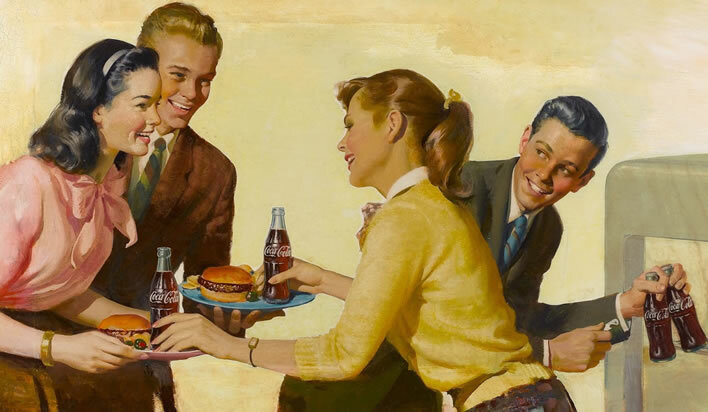 Harry Anderson, advertising image for CocaCola. Fifty years ago, young people couldn't wait to start behaving like adults. Now, more and more, adults are starting to behave like young people caught up in the febrile bubbling of the American educational system and it is the social media applications which are the instruments of this change. I am told that we can 'friend' and 'unfriend' people, 'like' or 'dislike' what they say and even 'block' them from ever contacting us again. Users jealously count and compare the number of their 'followers' and opinion leaders such as celebrities can reach out to their millions and share every trivial moment of their days. These applications were conceived and designed in US universities and their functionalities are those required by adolescent behaviour. The characteristics of an implement determine the manner of its use – the medium is the message as Marshall McLuhan (that flâneur!) so confusingly put it –	and thus no one should be surprised that an implement crafted for the puerile needs of the adolescent college student, once in the hands of the supposedly mature will turn even a grande-dame into a pubescent brat. 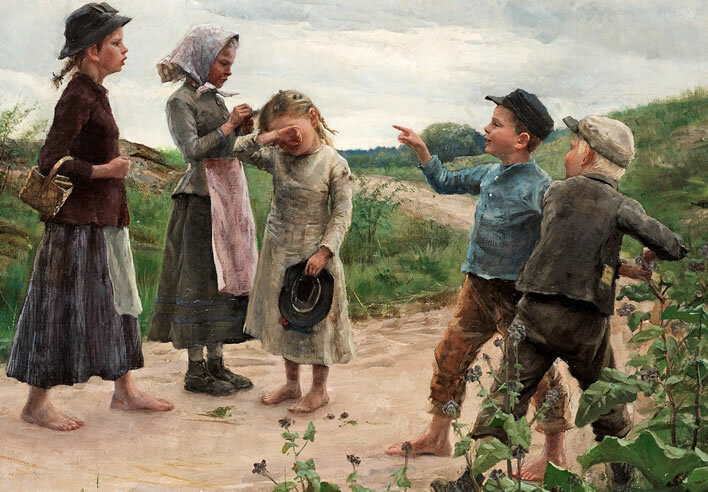 Fanny Brate, Teasing Children, 1885. Seemingly solid, middle-aged people enter the global frat-house that is social media and within minutes they are behaving like sixteen-year-olds with all their loves, hates and inner turmoil. Opinions, approval, criticism, shock, disgust and rejection continuously swirl around those in the middle of all this bubbling emotion. We can now judge, criticise and insult our fellows, not just in whispered, giggly discussions in our frat clique, but around the entire globe. 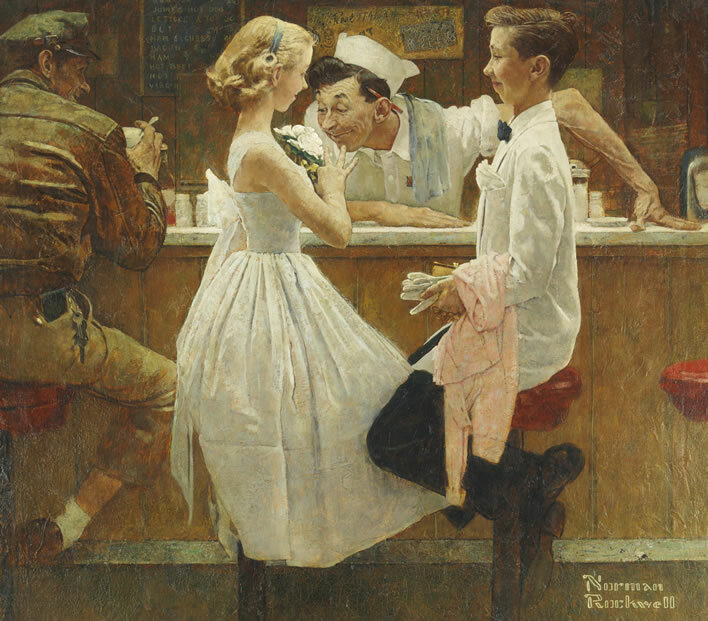 Norman Rockwell, After the Prom, 1957. The social dynamics of Facebook and Co. are the social dynamics of the adolescent and the college yearbook. The golden successful ones push their success and bask in the adoring envy of others; the members of the bitter and rejected mob turn on the golden ones and each other at the slightest provocation. Staying sane among all this is simple: don't ever use social media, they are not social at all. Problem is, Twitter is too specialized, its content too transient. Twitter is like a cocktail party where the conversation never stops, and where you can pop in and take part, but where it’s difficult to discover what exactly was said before you go there. It’s only for the truly Internet-savvy. Casual users don’t get much out it. You also have to like to argue and pay attention, which isn’t most folks. So I think Twitter is already at its true maximum in terms of active users. All this got me thinking about the effect Facebook has had on our public discourse. And you quickly realise that, without putting too fine a point on it, Facebook has had a terrible effect on the level of discourse in the UK. It bears quite a bit of of the blame for the soundbite-laden, fact free shouting match that much of modern politics has become. Worse still, it has ruined the Internet. It has taken a network which was once a freewheeling, intellectually-focused place for the exchange of information and views and turned it something resembling the future that was imagined for TV in the early 90s. Facebook dominates the online sphere, dumbs down debate, smothers other media companies and brings out the worst in people. So, without further ado, here are nine ways Facebook has ruined the Internet. Alex Proud, 29 June 2016: Facebook brings out the worst in people. Here's nine reasons why it's ruining the internet.